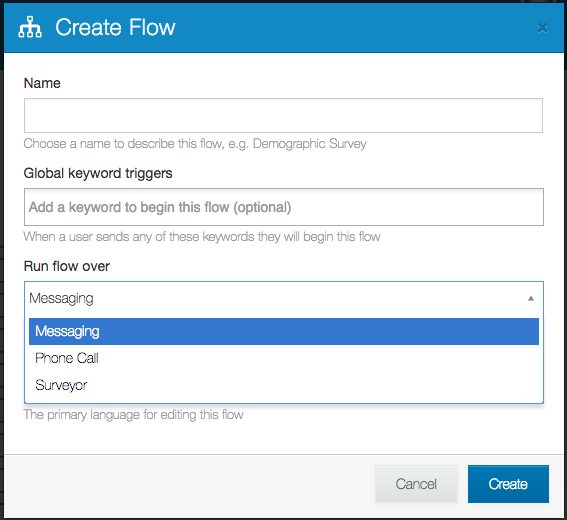 We provide three flow types that are made available depending on the capabilities of the channel you've connected to your account. Messaging workflows are applied to SMS and social media channels, as well as our Surveyor applications, while voice workflows differ in structure. Messaging is the default flow type, as every channel type necessarily includes text-based messaging functionality. Messaging flows can be sent over an Android channel, a virtual number, or a social media platform like Twitter. If you have a voice-enabled channel connected to your account (e.g. a voice-enabled virtual number purchased from Twilio) you will be given the choice to create an Interactive Voice Response (IVR) flow when you enter the "Create Flow" dialogue. IVR flows allow you to apply flow logic to voice-based messages sent via phone calls. Check out our IVR section for more information about IVR flows. Select this option to create a flow to run offline using one of our Nyaruka Surveyor Android applications.